After eight distinguished years of dedicated service as Secretary of the Board of Directors of Armenia Fund USA, Khoren Bandazian, a highly respected member of the Armenian-American community and experienced corporate and real-estate attorney, assumed the position of Chairman of the Board. Mr. Bandazian succeeds Raffi Festekjian of Boston, MA, who served as chairman since 2006. Mr. Festekjian was instrumental in bringing a contemporary vision to Armenia Fund and reaching out to a new generation of board members and supporters. Mr. Bandazian brings a wealth of executive experience gained in his professional life as well as the many other Armenian organizations and causes with which he has associated himself since he was a young adult. He has served on various committees organized by the Armenian Diocese and the Armenian Prelacy, such as the 1700th Anniversary of Christianity in Armenia committee, to name but a few. He has also served on the board of Sts. Vartanantz Armenian Apostolic Church of Ridgefield, NJ. In 2007, Mr. Bandazian chaired Armenia Fund USA’s 15th anniversary gala at the United Nations, which raised over $2,000,000 in support of the organization’s efforts. “Over the years, many eyes have been on Khoren as one of our community’s most promising up-and-coming leaders of the next generation. Now, in the prime of his life, he has accepted to take on this added and serious responsibility using his multi-faceted skill set. We couldn’t be more proud,” says Kevork Toroyan, who served as Chairman of Armenia Fund USA from 2002 to 2006. 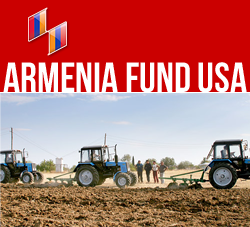 Mr. Bandazian is one of the longest-serving Armenia Fund USA board members. His history with the organization offers a keen understanding of Armenia Fund’s mission as he leads the organization into new efforts to improve the social and economic conditions in Armenia and Karabakh through infrastructure and other development projects. As chairman, Mr. Bandazian will oversee all activities of Armenia Fund USA. In addition, he will coordinate efforts with the heads of the 20 other Armenia Fund affiliates worldwide, as well as the Hayastan All Armenia Fund, headquartered in Yerevan, Armenia. Mr. Bandazian currently is a partner at Carella, Byrne, Cecchi, Olstein, Brody and Agnello, a general practice law firm with 40 attorneys where he specializes in corporate and real estate matters. He began his law career at the general practice law firm of Winne, Banta, Hetherington, Basralian & Kahn in New Jersey. “I am honored to step into the leadership of Armenia Fund USA, following in the footsteps of our prior leaders Berj Setrakian, Hagop Kouyoumdjian, Kevork Toroyan and Raffi Festekjian,” stated Mr. Bandazian on the occasion of his election to Chairman. “These prior chairmen, especially Hagop Kouyoumdjian, demonstrated commitment to this organization that will be difficult to match. I look forward to bringing my experience and skills to bear on one of the most important missions we have as a people—the reconstruction and redevelopment of our Homeland. Every effort to help our developing nation should be undertaken by our Diaspora. Armenia Fund provides a unique vehicle for these efforts by consolidating our resources and channeling them towards growth of Armenia and Karabakh”. Mr. Bandazian also pointed out that, “Armenia Fund is the most comprehensive organization dedicated to redevelopment efforts in Armenia and Karabakh. It is also the most universal of any other Armenian organization. Armenia Fund crosses religious and political lines to unite our efforts for that with which we can all agree - the rebuilding of Armenia and Karabakh. Trustees of the Hayastan All-Armenian Fund include both Holy Sees and representatives from most all major Diasporan organizations. It is truly a national and collaborative effort that we can be proud of as Armenians. I hope to continue this spirit during my tenure and strengthen our reconstruction efforts”.